Originating in Germany as a working breed, the German Hovawart is a large and robust guard dog. They nearly became extinct but were revived during the 1920s. This breed enjoys popularity in their native country but are rare and virtually unknown in the United States. The German Hovawart is a hardy and weather-proof dog. Males are powerful in appearance and muscular. Females have a more elegant appearance and are smaller in size. This breed is versatile, well-balanced, and self-confident. The German Hovawart breed is not recommended for inexperienced or sedentary owners. They are loyal, dominant, and have a tendency to become closely bonded with one particular family member. They are affectionate and protective and do well with children they have been raised with. German Hovawart's may be aggressive with same gender dogs but does well with other household pets known to them from puppyhood. The German Hovawart is reserved with strangers and will defend their family, property, and territory with great passion. Regular brushing to prevent matting and tangling is required for the German Hovawart. Bathing should be done when necessary. This breed is relatively healthy. However, there are low incidences of hip dysplasia and underactive thyroid. 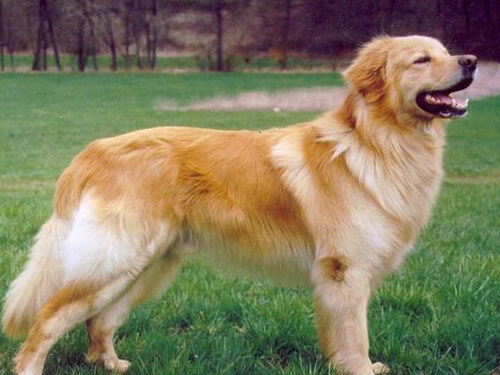 The German Hovawart is a double coat breed. The outer coat is long, slightly wavy, dense, and close lying. It is longer on the legs, chest, stomach, and tail. The under coat is fine and thin. Highly intelligent, the German Hovawart excels in Schutzhund. Early socialization and obedience are a must. They do not respond to harsh or heavy-handed methods. Training must be done with firmness, fairness, patience, and consistency. German Hovawart's are not recommended for city or apartment living. They do best in a rural setting with ample space to roam and run. They must have a job to do. The German Hovawart is ideal for escue, tracking, watchdogging, hiking, and backpacking.